Jeanne Traxler with the Peanut Butter & Jelly Company. Photo by Craig Bailey/Perspective Photo. Talking with Jeanne Traxler was like having a comfortable conversation with a longtime friend, only we’d never met and, instead of chatting over coffee, we were conferencing on the phone as a quick break in our days. 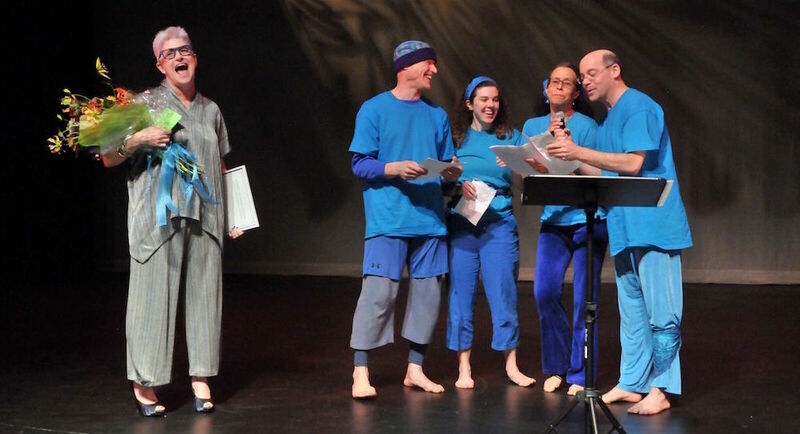 This past April, Traxler was honored as the recipient of the 2018 Boston Dance Alliance (BDA) Dr. Michael Shannon Dance Champion Award at the BDA gala. Being honored in this way took Traxler from feeling a “little cynical at first; I’m not a big about awards”, to “incredibly moved, really grateful and incredibly humbled. My friends came out, the dancers sang a song, it was a fantastic evening, and I even had a great dress,” Traxler happily chuckles. Jeanne Traxler with students. Photo courtesy of Traxler. 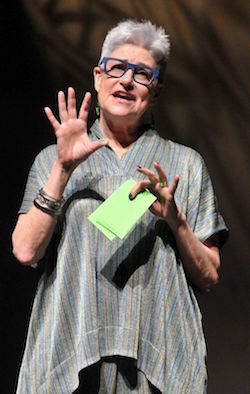 Traxler is the founder and director of the Brookline-based Peanut Butter & Jelly Dance Company that comprises a professional company, children’s dance classes and the “Small Feets” youth performance troupe, which has reached more than 70,000 students since 1980. BDA Executive Director Debra Cash says, “Jeanne Traxler’s exuberance has transformed countless young dancers’ lives and introduced them to their own potential.” Dr. Michael Shannon, the namesake of the Dance Champion Award bearing his name, was a world-renowned pediatric toxicologist and former head of emergency medicine at Children’s Hospital in Boston. He was known as the “dancing doctor” for his exuberant interest and participation in the art form. 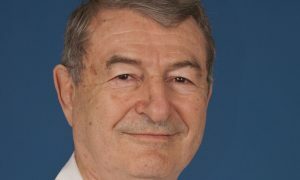 He also served as President of the Boston Dance Alliance Board. When speaking with Traxler, it is apparent that her passion for teaching dance to children parallels Dr. Shannon’s commitment to being a medical advocate for children. Their professional passions manifested in different ways, but concern for the welfare of children and a love of movement are definitely shared qualities. And what makes dance so special? Traxler adds, “First, it’s physically engaging. Kids don’t get enough outdoor and movement time. Many people live in small spaces, so even if you do dance in your living room, there’s not much space. Children also spend a lot of time in scheduled activities, rather than activities that are free in movement. Kids also spend a lot of time in car seats and strollers, and they are very bound up a lot of the time and not having time to move their limbs. Creative movement is very open ended. It stimulates eye/hand coordination, and improvisation helps with problem-solving and learning how to work in small groups and follow directions. Dance has all the benefits of school. It’s about conceptualizing material and using things you know to produce art. Children take an idea and respond to it in an artful way. If you know something about the planets, you can do a dance about space. You can do a dance about dinosaurs because you know some things about dinosaurs. Kids can move toward dance in a basic way, and they can move to other levels and other kinds of things. Kids from our classes do not have bad habits, and they know how to move their whole body and to think in a ‘dancey’ way about dance things. They also know how to concentrate.” These skills, says Traxler, will help a child with any future endeavor. 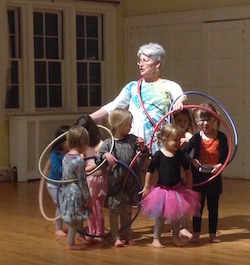 Jeanna Traxler and students make a group shape. Photo courtesy of Traxler. 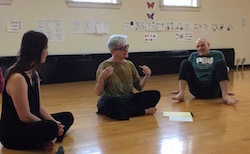 Jeanne Traxler teaching a workshop at University of Wisconsin at the 90th Anniversary of the Dance Department Celebration. Photo courtesy of Traxler. 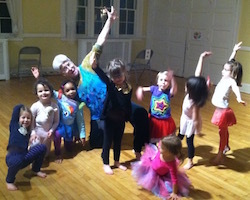 For more information about Jeanne Traxler and Peanut Butter & Jelly Dance Company, visit pbjdanceco.org.